Finally, after waiting almost nine months, my new 3D printer has arrived! The FABtotum is a hybrid machine which does both 4-axis milling and 3D scanning in addition to extruding hot plastic. Back in August last year, when I ordered this machine, I was originally researching new architectures to implement on a new printer build. Then I discovered the FABtotum blog and one page in particular where they discussed different cartesian configurations and their pros and cons. The design decisions seemed really thought through and seeing they had recently finished a successful Indigogo campaign I read up on the rest of the design which also looked solid. It was time to try out a turn-key solution! Currently I'm going through the calibration process so time will show if it delivers on it's promise. Disclaimer: this is a big "do not try this at home"-post as it involves flammable gasses and explosions, so don't! Wait, who am I kidding - you're totally going to try this at home aren't you... just don't say I didn't warn you when you stand there missing an eyebrow! Light it up! Watch your fingers! So, we recently did a project at work where we needed some fiery effects to spice up a car shot. To be precise we wanted the car, a CG rendered Lamborghini Aventador, to have exhaust flames - and really cool ones at that. The usual route would be to create these digitally using a variety of tools, for example Trapcode Particular. As we had just a week and a half to produce the whole spot we had to be creative to make sure we finished on time. That meant going old school and shooting a practical effect in camera - allowing us to bag that particular effect in 20 minutes and focus on the rest of the 3D and compositing instead. 1 x small plastic bottle. We used a 33cl bottle from Ramlösa. You can go bigger, but this was plenty to get the effect we were looking for. 1 x refill canister of Butane gas (ie lighter fluid). You probably can use a regular lighter as well, but you'll need more time to fill the bottle. 1 x lighter, preferably the "long nose" or "expanded reach" kind. If you have long matches that'll work as well. The important part is to keep your fingers safe. 1 x roll of gaffer tape to anchor the bottle to something sturdy so it doesn't shoot off when ignited. 1 x needle, nail or piece of steel wire. I used a paper clip. There's not much too it really. Holding the nail in the pliers heat it using the lighter. Then, quickly, poke a hole in the bottom part of the bottle. You might have to reheat the nail a couple of times to be able to expand the hole so it becomes big enough. First of all make sure you are in a well ventilated room where there's nothing flammable. You'll need something sturdy and heavy enough to fasten the bottle to. This way it won't fly away when you ignite the gas. Gaffer tape is nice to use for the fastening. If you get the matte black kind it can also be used to make sure the bottle doesn't reflect any of the light - making the compositing easier later on. Set up your camera and frame your shot. Now we add the gas. Insert the butane gas nozzle into the hole you made earlier and give it a quick push. You don't need much since it will be liquid when pushing the container down onto the bottle. 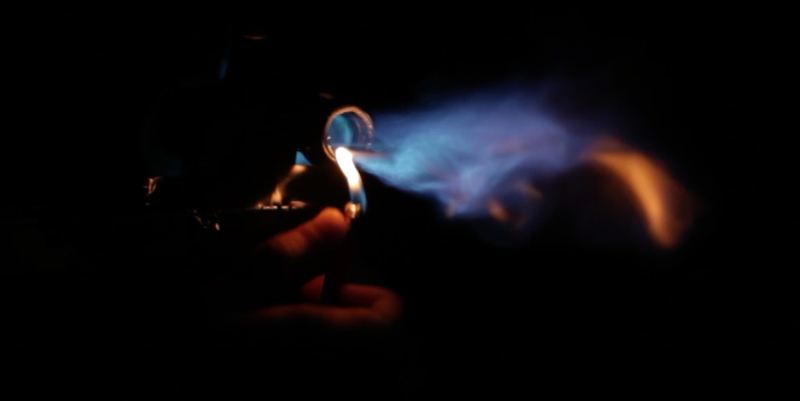 To much butane will not create a bigger explosion since the air/gas mix will be wrong resulting in no explosion at all. Put the butane canister somewhere safe away from everything. Now turn on the camera, turn off the light in the room and set the flame from the lighter to the small where you added the gas. If you got the mix correct you will hear a satisfying pop and see a bluish flame. If not you might try to add some oxygen. A bicycle pump should work. Use the small hole for this as well. Keep going until all the gas has been burned away. Before trying again you have to add fresh oxygen by using the pump for a little while more. Add more gas, light, retry. Only steps left is to choose best part of shot and add to comp. I'm not going to go into that part here since it's fairly trivial. Betsafe Gumball (:20 TVC) from STRIPE Studios on Vimeo.